Each card has a colour drawing of a Korean building, museum or tourist attraction with a brief description and details of how to get there. Baraja Turística de España by Heraclio Fournier, 1966. Gold plated souvenir playing cards from the Burj Al Arab Jumeirah hotel in Dubai. Columbian Exposition Souvenir playing cards, G.W. Clark, Chicago, 1893. Discover Romania souvenir published by Editura Foton, 2010. Greek Mythology playing cards published by Michalis Toubis S.A., 1995. Hong Kong Souvenir playing cards. 'Inka-Dynasty' playing cards are based on historic 16th century designs by the Peruvian chronicler Felipe Guamán Poma de Ayala, and printed by Power Casinos, Lima, Peru, c.2004. Irish souvenir playing cards. The Joker has the inscription W.O., Dublin. Views of Bath is Georgina Harvey's third design, created in 1990. The cards feature beautifully designed double-ended courts and double-ended Aces with a central band which is used to identify different views of the City of Bath at each end. 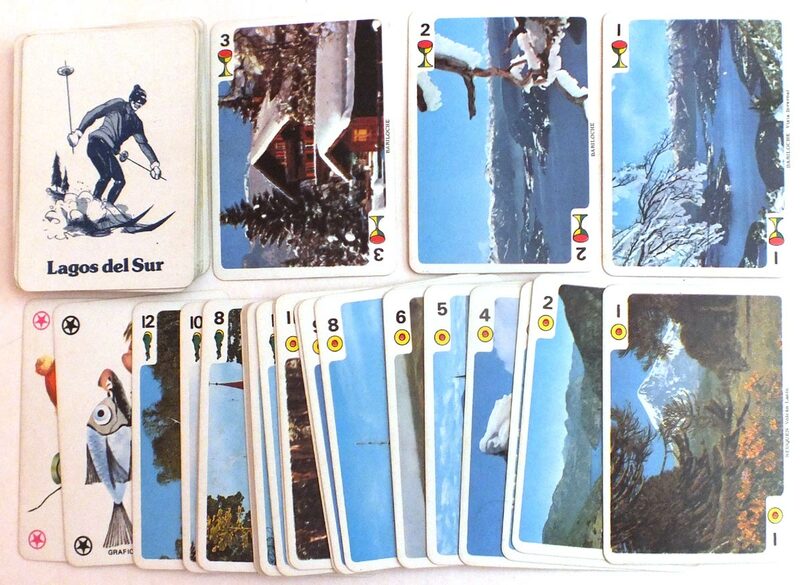 Lagos del Sur Souvenir playing cards published by Gráfica S.A., Buenos Aires, c.1980. Souvenir playing cards from Malaysia featuring 56 colour photographs of scenery, wildlife, local people and Malaysian fruits with inscriptions in English describing each scene. Souvenir playing cards from Malaysia featuring 56 colour photographs of skyscrapers, wildlife, local people and Malaysian fruits with inscriptions in English describing each scene. Mayan Playing Cards from Guatemala / Baraja Maya / containing illustrations of archaeology, art, folklore, history and mythology of the Mayans. Menorca Souvenir by Savir S.A.
Missouri Souvenir playing cards designed by OnPoint Speciality products in the USA, 2017. Special souvenir playing cards for entertainment events such as theatre or sport were an early form of merchandising. After the first edition of this deck in 1916, subsequent issues featured new photos as new stars rose to fame.